Johnson babies: Dora the Explorer Live! Squeaks loves Dora the Explorer. One of her first attempts at a tv song recital was "I'm the map". And everytime we get in the car and drive in a certain direction, I have all three in the back singing: "Where are we going? Grandma's house...". 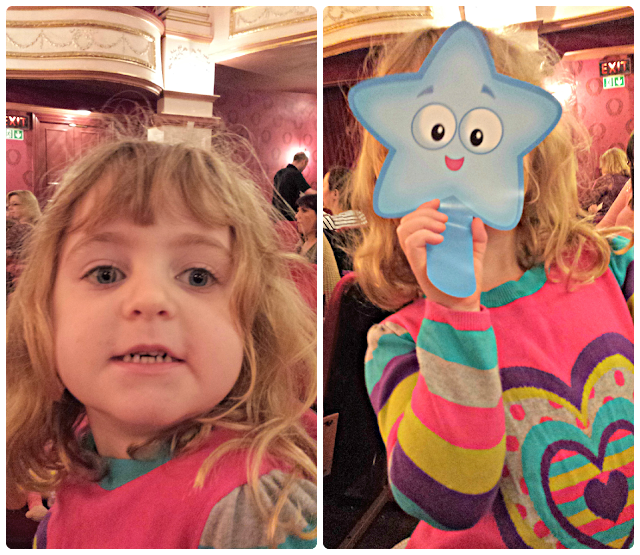 So, when we heard Dora the Explorer Live was going to be at the New Theatre, Cardiff we snapped up tickets. Dora the Explorer was the first production I have seen where all voices are pre-recorded. This really helps children in identifying with the voices of their favourite characters. You'd have think this makes for an easier job for the performers. But I half expect the air conditioner was on for their benefit. How actors can leap and dance around in what must be stifling outfits- well, hats off to them. The show is the story of Dora the Explorer and the City of Lost Toys. Following the same format as the television episodes it is straightforward for children to follow. It is all singing, all dancing, and all for audience participation. Squeaks was more vocal than ever. It was ok, she wasn't alone. The performance has all the regular characters, and as an added bonus for Squeaks it also had Diego. It had bubbles and singing and dancing. As an adult, you might question why you're there. As a parent it is great to see a tv programme brought to life for your child's entertainment. It absolutely replicates tv on stage, with the added bonus of interaction. For any child who loves Dora, this will definitely exceed expectations. Dora the Explorer Live is currently touring the UK.